At least 17 states have passed laws regulating salvia divinorum, most of them with outright bans on its possession and distribution. Now, two more states, Maryland and Minnesota, are poised to join them, the former with legislation limiting its possession to adults and the latter with an outright ban. 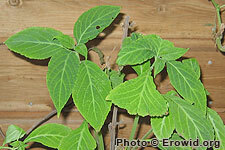 Salvia, a Mexican member of the mint family, is a powerful, fast-acting, short-live hallucinogen. Traditionally used for shamanic purposes in Mexico, it has in the past few years developed a following among youthful experimenters and sophisticated psychonauts alike. While the DEA has been monitoring salvia as a "drug of concern" for the past nine years, it has yet to move to add it to its list of controlled substances. But since 2004, when Delaware became the first state to ban salvia, more and more states have moved to fill the regulatory void. Minnesota may be the next to respond to salvia by prohibiting it. The state Senate Monday passed SF 2773, which makes possession of any amount of salvia or its psychoactive ingredient, salvinorin A, guilty of misdemeanor and anyone selling salvia guilty of a gross misdemeanor. A companion measure, HF 2975, has passed the House Public Safety and Oversight Committee and awaits a House floor vote. Carol Falkowski, director of the alcohol and drug abuse division at the Minnesota Department of Human Services told the Minnesota Daily the federal government had not regulated salvia because of a lack of evidence of its risks. "They don't have a preponderance of evidence about the negative consequences," she said, supporting the bill. Maryland is taking a more enlightened approach. On Monday, the state Senate passed SB 17, which prohibits the distribution of salvia or salvinorin A to anyone under 21. Companion legislation has passed the House Judiciary Committee and awaits further action. The bill is an improvement over a similar bill offered last year. Following the lead of Ocean City, which banned salvia several years ago, last year's bill would have simply criminalized the possession of distribution of the plant. But last year, the ban bill ran into opposition led by the Drug Policy Alliance, which lobbied legislators with information about salvia's research potential and relative safety. It looks like that effort paid off. And I think any misdemeanor is pretty gross. Let's see: worldwide since 1998 one (1) death occurred allegedly after using Salvia divinorum; judging by WHO and ACS estimates 50,000,000 from chronic use of hot burning overdose commercial $igarettes. PLEASE, anytime you mention Salvia divinorum, include a reference to The Salvia divinorum User's Guide http://www.sagewisdom.org/usersguide.html it may save this amazing herb...and our species as well! They should look at the positives that could come from the herb. It's potential medicinal purposes are not something to overlook. Only one death has occured with no direct link to salvia. Why waste time and money on passing laws that makes an herb, when used responsibly, illegal? Like I mentioned, responsibly, only by an 18+ year old. Why not regulate it? Making it illegal will just make it more thrilling for kids, and it's definately not going to stop it from getting into their hands. If you're going to put laws on the herb, regulating is the only way to go.